The other day, I wrote an article that ran on The Blood Angels by Jawaballs that talked about 3 things you can do to maximize your HQ. If you haven't' seen it, check it out and then come back to read this follow up. You'll need to read it and the comments to put this 3-part series into perspective. 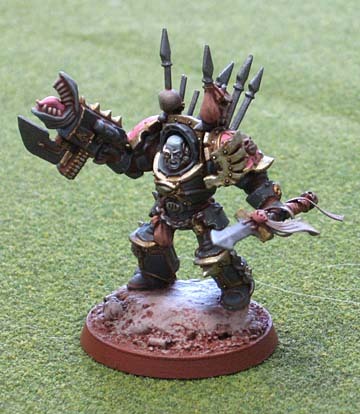 My question is, have I modeled and painted him (my HQ) wrong? Have I set myself up for failure by doing it this way? I talk all the time about things you can do to make your army better. Posts like: Five things to make your army stand out, Improving my basing (and yours) and The difference a wash can make. All of these are geared towards improving your modeling and painting so you can get the most from your army. Or do they? Let's put the model into context. Below is a shot of the whole army. In this picture is my Commander. I should mention here that it was standard practice to inform my opponents of what weapons "counted as" what so there was no confusion. The army is a "counts as" Deathwing modeled in a Slaanesh scheme. Sometimes referred to as a "Lustwing." So let's break down the original post and address the first part of it here. Is he painted to the best of my ability? Other than me telling you I did the best job I could, you have no possible way of knowing. You could look at some of my other work and compare it, to make sure I wasn't lying or I didn't have someone else do the whole thing for me. He does have some freehand and clean line highlights. Those should count right? Of course the rest of the army is painted like that too. He is painted to the best of my ability, but then again all of them are. There are only 26 models in the entire army so I was able to spend a bit more time on each and still not take forever getting the force completed. I'm not sure even applying what some might consider the standard of "three color minimum" matters. While I used a limited palette of only 7 or so colors for the entire army, he meets the "minimum" standard in the end. But isn't painting the "best you can" still relative? I mean who's to say it's my best other than me? Maybe it could be looked at in terms of work put into the model. Maybe you can look at a character and see how much effort was put into painting all the details on the model. Did the person paint all the little gems? Did they take the time to highlight all the chain links and bolts on the armour? Or did they just glance over all those kinds of things like you might do for a rank and file troop. Looking at my model here, I painted all those things. But then again, I painted all those things on all the models in the army. 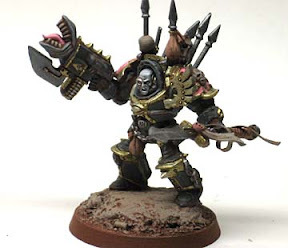 He was (and the army overall) an experiment in priming with a different color other than black. It made a huge difference in the look and feel of the army in the end and is a technique I would highly recommend to someone looking to unify their force both as models/units and the environment they're in. Maybe that's it... maybe someone's best can be judged on what they learned when it came to painting their models. Did they or have they improved since the last thing they painted? I definitely learned something about alternative colors for priming here. That would make it a success then right? The impact your "best" can have. In the original post, I talked about the impact the painting of your HQ can have. Your opponent is going to look at your HQ and your army overall and it will affect them to some degree. I've talked about this before when it comes to using Codex colors schemes and having all the associated "psychological" baggage that comes along with an army because of it. Both good and bad. I even created this painting quiz to show folks what I mean. Understanding this can help you when it comes to playing/fielding your HQ and we'll cover that in the third post. Whether you paint your HQ to stand out from the crowd and be easily spotted across the table or you paint him to blend in with the rest of the force, it will affect how you can use him. Will it change his stats, no, will it change how he is perceived? Absolutely. What does painting matter in the end then? Aside from meeting the "three color minimum" in events where it's required, it's a good question. If you've taken the time to choose your force, select the specific units you want to field, determine who your Commander will be and equip your him just the way you feel he should be... why not paint him up to the best of your ability? Why invest all your time, effort and money into getting all the pieces you need and building your HQ only to stop there and not paint him up? You don't have to be a Golden Demon painter to get good results. It's not about judging your work against others, it's about doing the best you can when it comes to painting your own stuff. There will always be a better looking army out there. There will always be unpainted armies out there. It doesn't matter what skill level you're at, take your time, invest your efforts into the details on the model and try to teach yourself something while painting him and you'll be pleasantly surprised how he turns out in the end. Maybe you want him to be seen from a mile away... maybe you want him to be forgotten in the middle of combat. Either way, put your best into painting your HQ and you can't go wrong. As a stand-alone article, it gets across the message well, and that shows it's strength. The_King_Elessar: Thanks, I debated posting this series for the past week, but I thought it might help folks understand where I'm coming from. I have to say that this article was inspiring. I even sent it to a few of my club so that it might kick them in the pants. We've had some issues with the "it's not going to be good so why even try" mentality of painting. So thank you! And for a newbies perspective of the hobby please see my blog! ServvsUmbrarum: Thanks, I'm glad you've been able to use it. Part three will tie everything together and put it in perspective I think.